"ma nun me lassà/nun darme stu turmiento!/ Torna a Surriento/ famme campà"
"Qui dove il mare luccica/ e tira forte il vento/ su una vecchia terrazza/ davanti al golfo di Surriento"
Perched on a plateau above an imposing tuff stone cliff, Sorrento is without doubt the most famous resort of the homonymous peninsula, surrounded by the lush of a rich Mediterranean vegetation, with fragrant lemon groves, orange trees and dark and twisted trunked olive trees. At first a Greek -Oscan colony, and then Phoenician, the traditions narrate that the mythical "Sirens" lived in its waters, those who tried to capture Ulysses with their melodious songs. The name, not surprisingly, derives precisely from the greek "Syrenusion" or "Syreon" or "land of the Sirens." It followed the fate of Rome, becoming a "municipium" in 89 B.C. and residence of the rich and wealthy patricians, that built here their most sumptuous "villas". In the Dark Ages it became a Republic and was cited as one of the most important maritime cities of Southern Italy, under the domain of the Duchy of Naples, from which it became independent in the XI century. Established the Duchy of Sorrento, which embraced the whole peninsula, from the river Sarno to Punta Campanella, it acquired considerable fame mainly to the presence of shipyards and a flourishing trade and a rich production of oil, wine and fruit. In 1544, it became the birthplace of the famous Italian poet Torquato Tasso. After a period of insignificant growth in the XVIII century, during the XIX, there was an economic revival with social and cultural benefits for the entire peninsula, when Sorrento was included in the "Grand Tour", a trip between the most significant localities of Italy, a important stage, for all the young Europeans that wished to complete their studies. 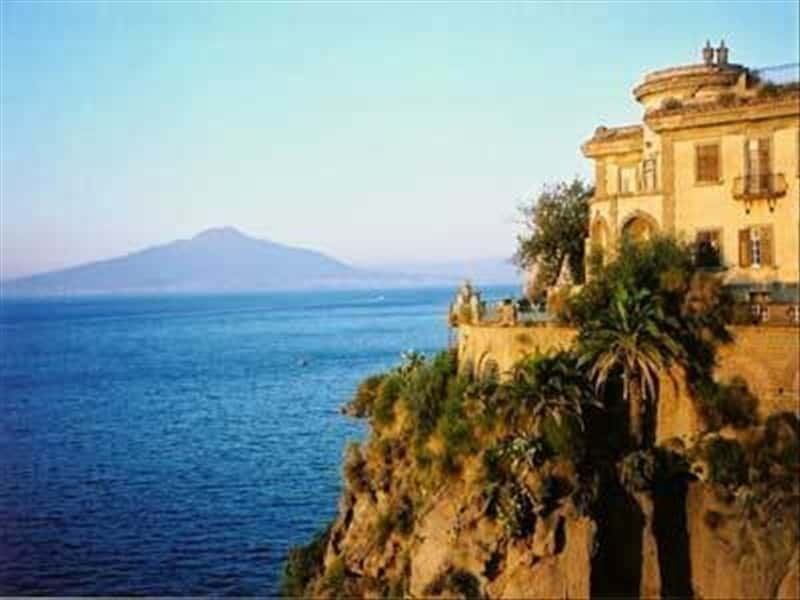 During this period Sorrento hosted important visitors, such as: Byron, Keats, Scott, Dickens, Goethe, Wagner, Ibsen and Nietzsche. - the Correale Museum of Terranova, in which are exposed interesting finds of the past; important is the archaeological section, with the famous Base of Augustus, and the medieval section, with marble works dating from the X and XI centuries. It also features a wide collection of furniture, porcelain and paintings. - the Museum Shop of wooden inlays, which houses an important collection of furniture and objects that highlight the uniqueness of the art of inlaid woodwork in Sorrento. This town web page has been visited 816,463 times.